Acclaimed for his timeless tracks that have been released across myriad prestigious labels like Crosstown Rebels, Knee Deep in Sound, and Circus Recordings, Serge Devant is a playful DJ and producer who embodies the original expression of living life to the fullest. Regardless of where life takes him, the enthusiastic artist and risk-taker is keen on staying true to himself and not be influenced by what’s deemed to be cool or happening in the scene. The classically trained artist left his hometown of St. Petersburg, Russia, to NYC in the mid-1990’s, and has since dominated the electronic music scene by performing in elite venues and festivals around the world. What makes his tracks successful and long-standing to this day are that he “creates a story with sentimental value that attaches to you, and not just have a monotonous groove with a breakdown” that can be heard similarly in other records. By incorporating vocals, outlandish sounds, or melodic breakdowns, he composes a centerpiece and gives the song a signature personality to withstand time. Since the advent and slow rise of VIP tables and bottle service that began in the early 2000’s, he’s noticed over the years how much more engaging and interactive parties are than what they used to be. He even states how “it’s ironic how something so small like a cellphone can take away from the listener’s music experience, but now more people are putting more effort into the parties with better sound, decor, and production.” By grasping your attention to a full multisensory experience, they can hopefully steer you away from any personal distractions. A few years ago, he left his hometown of NYC to live in the midst of palm trees and ocean breezes of Miami Beach, and has been encouraging other DJs to move down to the city of paradise as well. For the lighthearted artist, life is all about balance, and whenever he isn’t performing or producing in the studio, he turns to simple yet mentally stimulating activities like ping pong, chess, cycling, and water sports. Years from now, he hopes to continue doing what he loves now in this creative field. “It’s inevitable to know where life takes you, because no one can know for sure, but I hope to keep doing whatever makes me happy.” In another era, Serge could imagine himself directing and editing movies, for it’s a passion of his that can be seen in his past work, “Fearing Love,” that has won an accolade for Best Short Film award at the 2016 Hollywood Independent Reel Film Festival. After seeing how “big guys in the industry rise up and fall fast,” he declares he has no intentions or desire to explode and become super famous. With this slow evolution, he steadily maintains his prosperous career by keeping himself “warm, but never too hot” in the business. Completely content with where his life is and how everything is progressing, Serge plans to take things one step at a time, and continue conquering the world with his vividly rich tech house and deep house tracks. See him this week kicking off full-gear with a busy Miami Music Week schedule, and be on the lookout for his upcoming EP this May on Flying Circus. In the meantime, check out his latest remix of Fabio Aurea’s “Yini” that is currently number 3 on the Deep House Beatport charts. Support the charming artist now and see what he’s up to on his personal site. Damian Lazarus & The Ancient Moons have released their new track ‘Feedback Loop’. This is the latest single to be taken from their forthcoming new album Heart of Sky, out on July 20th through Crosstown Rebels. Showcasing the warm textures of Jesse Appiah’s soulful vocals and the Ancient Moons’ top notch production, ‘Feedback Loop’ already sounds like a classic and is undoubtably one of the album’s key moments. The song is about A.I., a conversation between man and machine, and rolls out of the speakers like a 21st Century update of Bristol’s Wild Bunch sound system. Rising Swiss label RADIANT dropped this Balearic deep groove bliss-fest just as the sun set on the summer last year. Conjured by fellow Swiss soul-stirrer Fabio Aurea, it’s a glimmering slice of cosmically charged house that’s ready and waiting for the sunny season ahead… Especially now it’s backed with these three exceptional updates. Crosstown Rebels’ Serge Devant takes the lead with a brisk switch into the later chapters of the night. Robust, rolling percussively-laced beats and warm bassline that plunges right beneath you toes as the disarming vocal takes over. 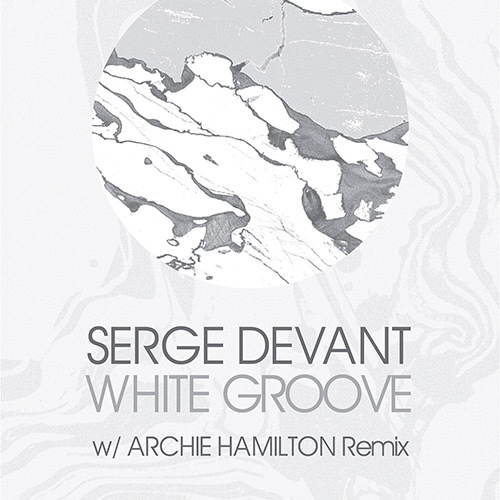 Serge Devant returns to one of his favoured label’s with his White Groove EP , delivering a pair of deep, textured tracks that’ll vitalise any rigid dancefloor. Archie Hamilton makes his Crosstown Rebels debut and supplies a punchy, tripped-out revision of lead track, White Groove . White Groove is an absorbing mix of rumbling sub bass, soft, textured percussion, and ethereal pads. Loose percussion and a tough kick carve out the initial vibe on C onnect To Server . A hypnotising, low-riding synth is the final layer and helps generate even more groove into this peak time roller. Archie Hamilton switches up White Groove, revising the bassline into a buzzing, forward pushing rhythm but retains the mystical feel of the original, bolstering the whirring pads and using intricate percussive sounds and FX. Serge Devant hails from Brooklyn, New York and released his seminal track Fearing Love in 2015 on Emerald City. Since then he’s been championed by Damian Lazarus, a firm favourite on both Crosstown Rebels and Rebellion, whilst also receiving plaudits for his releases on Knee Deep In Sound and Circus Recordings. Moscow Records, Moss.Co and Arkityp owner Archie Hamilton is one of the UK’s most promising talents, consistently releasing high quality house and techno on the likes of Get Physical, Fuse London, 2020 Vision, Fear of Flying among others. It's been almost 2 years since this record was made and it's finally seeing the light of day one and only Crosstown Rebels. Check it out on their SoundCloud page. Jonas Rathsman announces his latest offering with cutting-edge innovators Crosstown Rebels. ‘Complex’ featuring Josef Salvat is released on 10th June 2016. This is a tech-blues odyssey, an introverts primal scream, where complex emotions and urges are vented and perfectly complemented by Rathsman’s explorations into the dark corners of electronic music. Enjoy the journey. With the release only in the hands of a select few tastemaker DJs, ‘Complex’ has been making waves at the recent Miami Winter Music Conference, “receiving hands in the air welcomes and even a sit down ovation” according to label boss Damian Lazarus. ‘Complex’ is set to be the first underground anthem of 2016. The release comes with two carefully chosen remixes. First up is Swiss techno stalwart Deetron, who steers the song into percussive acid oblivion while Serge Devant offers up his deep house expertise for a dramatic and driving offbeat cut. With his instantly recognisable sound, Jonas has found praise the world over for his keen ear and transcendent sets, which have captivated listeners on both the international club and festival scenes. Following his BBC Radio 1 Essential Mix, Rathsman continues to showcase his technical capabilities and impressive track selection with his bi-monthly mix series ‘ELEMENTS’, now on its fourth instalment. It's been around six months since Damian Lazarus dropped the debut album from his otherworldy side project—Damian Lazarus & The Ancient Moons. Since then, the gang has released two singles, one of which was &ME's bouncy churning take on one of the album's standouts "Vermillion." Now, we've gotten our paws on NYC-based DJ/producer Serge Devant's take on the album's third single "We Will Return." Originally a steadily danceable, yet low-key track featuring some wonderful vocals from Ali Love, Devant takes things in a bit more of a sinister direction, installing some churning synths, while stretching out the track to a place even more fit for the sunrise dancefloor. Despite originally hailing from New York, Serge Devant has recently locked in close ties with one of London's own key music outposts Crosstown Rebels, falling in with the iconic warm and deep house aesthetic Damien Lazarus's iconic imprint when he made his first release this year with his Always On My Mind EP. The release was part of something of a comeback for the producer after being forced to take a year out from music in recovery following a devastating snow boarding accident. This became a time of reflection and development of his sound where he began working under groove informed direction, which also has been snapped up by Lee Foss and Jamie Jones' Emerald City music and Crosstown sub label Rebellion and is clearly already proving to be a positive upturn in his career.